The Elstead Adams 4 Light Interior Ceiling Lantern is in a British Bronze finish with a clear glass orb. The Elstead Adams 4 Light Interior Ceiling Lantern is in an Antique Nickel finish with a clear glass orb. The Elstead Adams 3 Light Interior Ceiling Pendant is in a British Bronze finish with a clear glass orb. The Elstead Adams 3 Light Interior Ceiling Pendant is in an Antique Nickel finish with a clear glass orb. The Elstead Aegean 3 Light Aged Brass Chandelier features hand-forged scrolls and cut glass droplets and sconces. The Elstead Aegean 3 Light Polished Brass Chandelier features hand-forged scrolls and cut glass droplets and sconces. The Elstead Aegean 3 Light Polished Nickel Chandelier features hand-forged scrolls and cut glass droplets and sconces. The Elstead Aegean 5 Light Aged Brass Chandelier is dressed with cut glass droplets and sconces. The Elstead Aegean 5 Light Polished Brass Chandelier is dressed with cut glass sconces and droplets. The Elstead Aegean 5 Light Polished Nickel Chandelier features hand-forged scrolls and cut glass droplets and sconces. The Elstead Aegean 8 Light Aged Brass Chandelier features hand-forged scrolls and cut glass droplets and sconces. The Elstead Aegean 8 Light Polished Brass Chandelier features hand-forged scrolls with cut glass droplets and sconces. The Elstead Aegean 8 Light Polished Nickel Chandelier is dressed with cut glass droplets and sconces. The Elstead Ahrendale Medium Ceiling Light has an open Anvil Iron mesh surrounding Vetro Mica shades. The Elstead Ahrendale Large Ceiling Light has an open Anvil Iron mesh surrounding Vetro Mica shades. The Elstead Ahrendale Single Ceiling Light has an open Anvil Iron mesh surrounding a Vetro Mica shade. Alcott Tiffany Ceiling Light - Quoizel Lighting. The Elstead Alcott Tiffany Ceiling Light has a Soft Green striped accent and Valiant Bronze finish metalwork. The Elstead Allier 4 Light Ceiling Pendant is in a Weather Oak Wood and Antique Forged Iron. The Elstead Allier Large Ceiling Light Pendant is in a Light Wood and Brushed Steel. The Elstead Allier Flush Ceiling Light is in a Light Wood with an opal glass diffuser. The Elstead Allier Small Ceiling Light Pendant is in a Light Wood and Brushed Steel. The Elstead Allier Mini Pendant is in a Weather Oak Wood and Antique Forged Iron. The Elstead Amarilli AML15BLK/SIL 15 light two tier chandelier is in a black silver finish. The Elstead Amarilli 3 Light Chandelier is in a unique black silver finish, with glass drops and traditionally forged scrolls and leaves. The Amarilli 3 Light Ceiling Light can be converted to a semi-flush light to accommodate lower ceiling heights. The Elstead Amarilli 5 Light Chandelier is in a unique bronze gold finish, with glass drops and traditionally forged scrolls and leaves. The Amarilli Ceiling Light is hand made in the UK, at the workshop of Elstead Lighting. The Elstead Artisan Aged Brass 3 Light Chandelier fearures attractive knot twist detailing. The Elstead Artisan Black 3 Light Chandelier fearures attractive knot twist detailing. The Elstead Artisan Aged Brass 5 Light Chandelier fearures attractive knot twist detailing. The Elstead Artisan Black 5 Light Chandelier fearures attractive knot twist detailing. The Elstead Ashley Bathroom Ceiling Light is in a Polished Chrome finish and is IP44 rated. The Elstead Avon Bathroom Ceiling Light is in a polished chrome finish and is IP44 rated. The Elstead Balance 5 Light Ceiling Light is a modern ceiling pendant in a Brown and Polished Brass finish. The Elstead Balance Single Ceiling Light is a modern ceiling pendant in a Brown and Polished Brass finish with a bottom diffuser. The Elstead Balance 5 Light Ceiling Light is a modern ceiling pendant in a White and Polished Nickel finish. The Elstead Balance Single Ceiling Light is a modern ceiling pendant in a White and Polished Nickel finish with a bottom diffuser. The Elstead Bamboo 3 Light Chandelier is in a bronze patina finish. The Elstead Bamboo 5 Light Chandelier is in a Bronze patina finish. The Elstead Bamboo 8 Light Chandelier is in a Bronze patina finish. The Elstead Baskin Single Ceiling Light Pendant A is in an Aged Brass and Dark Weathered Zinc finish. The Elstead Baskin Single Ceiling Light Pendant B is in an Aged Brass and Dark Weathered Zinc finish. The Elstead Baskin Single Ceiling Light Pendant A is in a Polished Nickel finish. The Elstead Baskin Single Ceiling Light Pendant B is in a Polished Nickel finish. 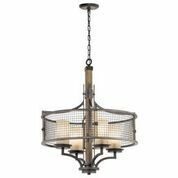 The Elstead Belfry 3 Light Chandelier offers hand-crafted metal work in a truly medieval design and black finish. The Elstead Belfry 5 Light Chandelier offers hand-crafted metal work in a black finish and a truly medieval design. The Elstead Lighting Belle Fleur Tiffany Ceiling Light Pendant is part of the Quoizel Tiffany Collectibles family. 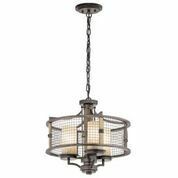 The Elstead Bluffton 3 Light Ceiling Pendant is in an Oil Rubbed Bronze finish with a perforated screen shade. 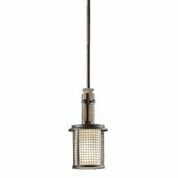 The Elstead Bluffton Mini Ceiling Light Pendant is in an Oil Rubbed Bronze finish with a perforated screen shade. Elstead ceiling lights are available from Luxury Lighting at competitive prices. Elstead have a very large collection of ceiling lighting ranging from a simple flush to the grand and elegant. Whilst Elstead are known for their quality traditional lights, their range has now been expanded to include modern, contemporary fittings while still maintaining their high standards. Elstead ceiling lights - quality, unique and stylish lighting to suit all. Please click on the products for full details and ordering.